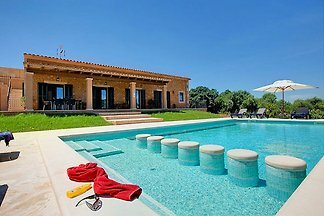 Lovely villa with private pool located in es Carritxó (Felanitx). With impressive views to the mountains, this rustic style house offers accommodation for 8 or 9 guests. Up to 10 guests are welcome to this majestic house in s'Horta, Felanitx, where a great private pool surrounded by nature and peace is waiting for you. Bright and Quiet 250m2 villa located in Calonge, Santanyí. This property offers wonderful views of the countryside and has capacity for 8 people. Welcome to this lovely rustical house for 11 guests in s´Horta. Comfort Finca on plot (21,000 m³) with private pool and nice views for 12 people. 6 bedrooms, 5 bathrooms, Internet, air conditioning, dishwasher and washing machine. This is a beautiful house in the countryside near s’Horta (Felanitx). It has capacity for 6 people and stunning views. 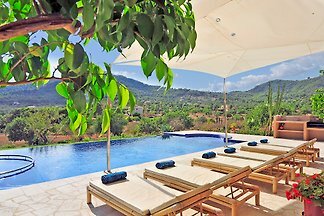 The elegant Finca "Es Serral" is slightly elevated and in absolute solitude in the middle of the somewhat flatter plain of the southeast. Welcome to this house with magnificent views on the outskirts of s'Horta. It is prepared for 6 persons. Modern Deluxe Villa with pool with children's area, 3 bedrooms, 3 bathrooms, dishwasher, washing machine, air conditioning and nice views. Comfort villa with private pool, heated outdoor jacuzzi, sauna and a beautiful garden for 10 people. 5 bedrooms, Internet, air conditioning, dishwasher, washing machine, dryer. Rent successfully your holiday flat or holiday home in Es Carritxo in only 20 minutes !